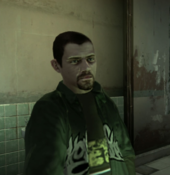 Lyle Rivas is a minor character who appears in Grand Theft Auto IV. Lyle Rivas is the cousin of Tom Rivas, both born in Puerto Rico. He was once a member of the Spanish Lords. He is a mechanic and a fence for stolen cars, and also has ties to illegal street racing. He is also a friend of Brucie Kibbutz. Both share a common interest for steroid usage. Lyle owed Brucie some money. Unluckily for him, his friend Brucie was once on a roid rage and ordered his friend Niko Bellic to kill Lyle for not bringing him his money. After Niko kills both Rivas cousins, he discovers the truth behind Brucie's reasons for ordering their deaths and ends his professional relationship with the steroid junkie. Affiliations: Member of the Spanish Lords. Puerto Rican mechanic and fence for stolen cars. Ties to the illegal street racing scene and the Spanish Lords. Avid body builder and steroid user. Brucie Kibbutz: "That guy, Lyle, had a car worth stealing. Can you get it?" Brucie Kibbutz: "The cousin of that guy you killed, Lyle Rivas, owes me a lot of money." Niko Bellic: It sounds like you got me to kill a load of guys because you were juicing too hard. [...] We can hang out, but I'm not killing anyone else because you've got the rage."